Bake foolproof French butter cakes and soft cookies with the Bellemain Nonstick Madeleine Pan. Its combination of old-time durability and modern convenience is irresistible ... and so are the sweet treats it creates! Commonly seen in extreme-use cookware such as woks, carbon steel is second only to aluminum in heat conductivity, and it's much more resistant to denting and bending than aluminum. So you can expect many years of turning out delicious, evenly baked little cakes for every occasion, from elegant tea parties to after-school snacks. It's the delicate shell-like fluting that makes madeleines so pretty ... and so difficult to get perfect. Traditional madeleine molds required heavy pre-greasing, and still caused quite a few damages when the baker tried to dig the madeleines out of them. But thanks to modern nonstick technology, your madeleines will slide right out of the Bellemain pan. 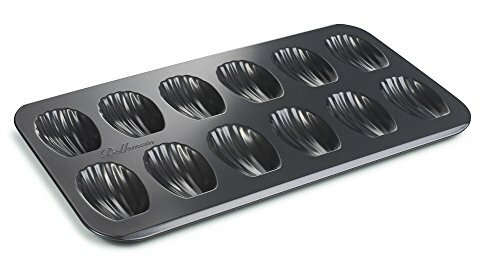 The nonstick coating also makes cleaning the Bellemain Nonstick Madeleine Pan practically effortless. No scraping or scouring necessary; it can even go right in the dishwasher.